If you want to receive publication announcements, please sign up. I only send emails when a short story (or my first novel) comes out, so you know where to look for it. Joy's short story "Ron" (published in Tin House last spring) is featured in Seth Fried's piece, The Funniest Writing You Haven't Read, for Electric Literature. Joy is the recipient of the Teach! Write! Play! fellowship from Martha's Vineyard Institute of Creative Writing, and will be attending MVICW's summer conference from June 9 - 15. Joy is part of the admissions board for the 2019 Bread Loaf Writers' Conference. Joy was a panelist at this year's WriteAngles Conference, at Mount Holyoke College, MA. Sara Rauch interviewed Joy about her preferences as associate fiction editor for the literary magazine West Branch. The interview is part of a series on Sara's blog, The Art of Landing, that will focus on literary magazine editors and their likes, dislikes, and processes. Joy was featured alongside several other authors at H.I.P. 's Lit's final event of their summer series, at Nowadays in Brooklyn, hosted by Erin Harris and Britt Canty. Joy attended the 2018 Bread Loaf Writers' Conference, in Ripton Vermont, as the Margaret Bridgeman Scholar in Fiction. She studied with Laura Van Den Berg. Joy's short story, "A Boy Who Does Not Remember His Father," appears in Issue Sixty of SmokeLong Quarterly. 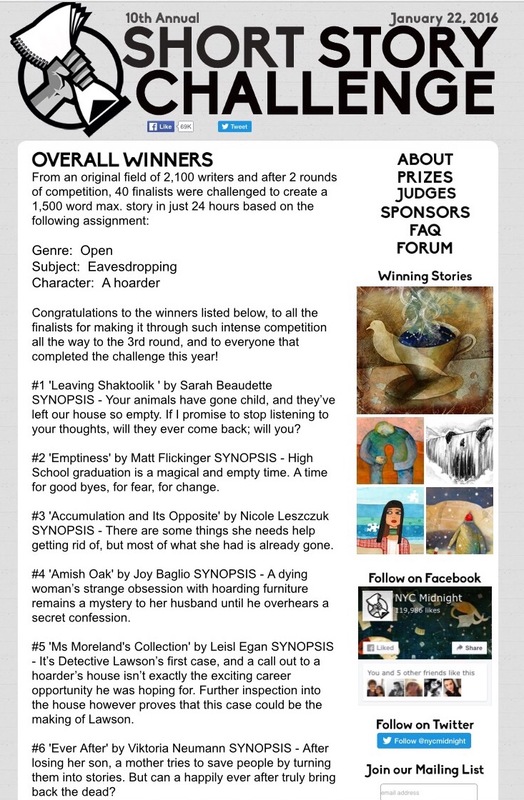 The story was a finalist for The SmokeLong Quarterly Flash Fiction Award. Mary Henn of SmokeLong Quarterly also interviewed Joy about her story. 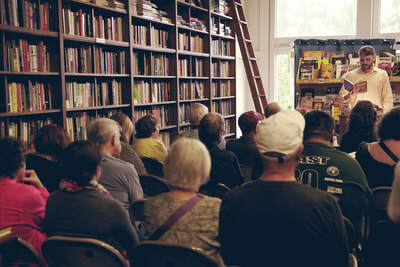 Joy read alongside New Ohio Review Editor David Wanczyk at a reading hosted by Pioneer Valley Writers' Workshop in Amherst Books, Amherst MA. Joy was awarded a Tuition Scholarship in Fiction for the 2018 Bread Loaf Writers' Conference, August 15 - 25. (Tuition Scholarships are "for writers who are actively publishing original work in distinguished magazines and literary periodicals.") She is very excited to attend the conference. Joy is a finalist for the SmokeLong Quarterly Award for Flash Fiction. Her piece, "A Boy Who Does Not Remember His Father," is forthcoming in the 15th-anniversary issue in June! Joy's flash fiction stories - "Belly of the Beast" and "Box of Ghosts" - were both finalists in American Short Fiction's annual flash fiction contest (The American Short(er) Fiction Contest). Joy was a finalist in MVICW's contest and was offered an author fellowship to partially cover the cost of conference attendance. 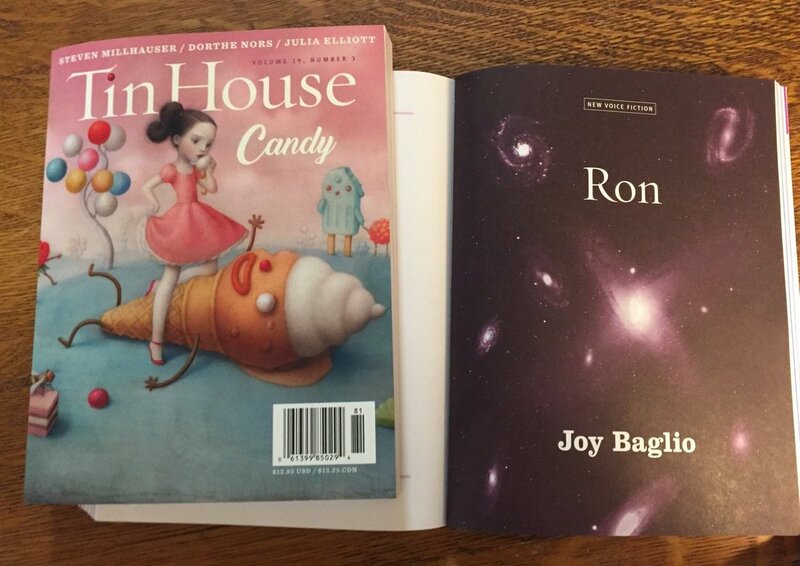 Joy's short story "Ron" is featured as a New Voice in Tin House's candy issue. Joy's short story "We Are Trying to Understand You" - about sentient AI and the last woman on earth - is in issue 153 (Winter/Spring 2018) of TriQuarterly. Joy joins the Bucknell University-based literary magazine West Branch as Associate Fiction Editor. Joy received a generous grant from The Elizabeth George Foundation to complete her novel, HOW TO SURVIVE ON LAND. The grant will allow her to focus exclusively on her novel in 2018, with an estimated end-of-summer completion date. It will also allow her to travel to the Aleutian Islands and Bering Sea to research the book. Joy's short story "End Grain" - about a dying woman's final wish - appears in the Winter 2017/2018 issue of The Iowa Review. Joy was interviewed by Janice Beetle about what inspired her to found Pioneer Valley Writers' Workshop, the literary arts organization she runs in Central MA, as well as her vision and future plans for the school. Joy is the recipient of the 2017 Gulliver Travel Research Grant, from The Speculative Literature Foundation. The grant will help her travel to the Aleutian Islands to complete research on her novel-in-progress, How to Survive on Land. Joy presented a workshop on flash fiction at the 2017 Write Angles Writing Conference at Mt. Holyoke College in Western MA. Joy was interviewed by Joan Axelrod-Contrada of Write Angles Conference about becoming a writer, her process, upcoming projects, and what she'll be presenting at the conference this year on 11/18. Check it out here! Joy will be one of four featured readers at the monthly reading series in Ditmas Park, Brooklyn. The reading takes place at Hinterlands Bar from 8-10pm. Joy's short story "We Are Trying to Understand You" was accepted for publication in issue 153 (January 2018). Joy was guest editor for Storychord this fall. Check out the issue she curated at storychord.com! "How to Survive on Land" - originally published in New Ohio Review in 2016 and re-printed / published in Menacing Hedge in 2017 - was nominated by Menacing Hedge for a 2017 Best of the Net Award. 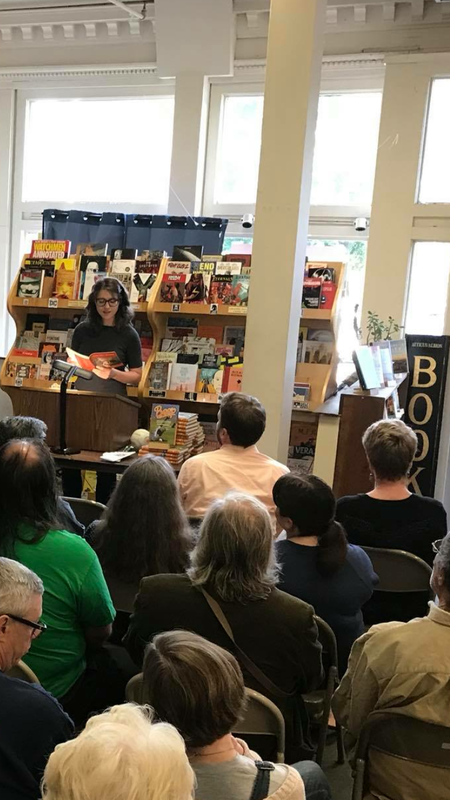 Joy attended Tin House's week-long summer writing conference in Portland, OR and studied in Aimee Bender's fiction workshop. Joy's short story, "Ron," was recently accepted for publication in the spring 2018 issue of Tin House, theme: "Candy." Joy's short story "Night Circus," which appears in the fall/winter 2016 issue of PANK, is selected for Wigleaf's Top 50 list. Joy is a semi-finalist for her flash fiction. Joy was a finalist for the Tin House scholarship as well as Bread Loaf's Katharine Bakeless Nason Fellowship. Both awards fund summer study. Joy will still be studying at Tin House this summer, in Aimee Bender's fiction workshop. Joy's short story "End Grain," which placed 4th overall in NYC Midnight's 2016 Short Story Challenge, was recently accepted for publication in The Iowa Review. Joy is a finalist for the 2017 Kathy Fish Fellowship at Smokelong Quarterly. Joy will be reading her work on 11/29 at Unnameable Books in Brooklyn, NY as part of Manhattanville Reading Series, a showcase for emerging writers. Joy will be teaching two upcoming writing workshops next month in Western MA, through Pioneer Valley Writers' Workshop. Joy's short story "How to Survive on Land" is in the fall 2016 issue (#20) of New Ohio Review as well as online. Joy was awarded the fiction Honorable Mention in the 2016 Ploughshare's Emerging Writer's Contest, selected by Anthony Marra. Joy's flash fiction story "Night Circus" won an Honorable Mention in the WOW! Women on Writing Spring '16 Fiction Contest. Joy's short story "How to Survive on Land" was a finalist for Arcadia Press' Dead Bison Editor's Prize. Joy's short story "How to Survive on Land" won 3rd place in New Ohio Review's Fiction Contest​. Joy attended the Tin House summer workshop and studied with Rebecca Makkai in her fiction class. and she was also a finalist in their short story contest for "How to Survive on Land." Joy was selected by Mary Gaitskill for a four-person master class at Catapult Books in NYC.